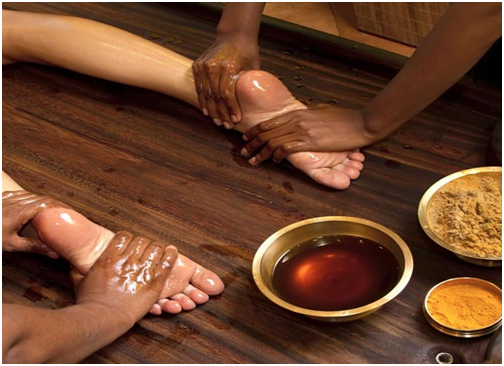 Abhyanga in simple terms means oil massage. It involves applying warm oil all over the body with gentle massage. As people grow up it is considered insignificant and gets ignored. But, one must remember how it was an important procedure followed during our growing years. Soon after birth, a baby is given oil massage before bath. This continues up to one or two years. The advantages of Abhyanga is well known and is now scientifically proven. Oil applied and massaged over the skin is absorbed through tiny pores, immediately moistening the skin. This procedure strengthens the muscles, joints and bones. It enhances the growth of muscles, imparts good complexion to the skin and keeps it glowing and moistened by avoiding dryness and cracks. Oil massage on the head nourishes all sense organs and induces good sleep. Thick, lusturous and dark hair definitely demands regular massage with good oil. These benefits continue to be so in adult life also. Everyday oil bath keeps one’s skin young and healthy, prevents rashes, itching, reduces aging process, removes fatigue and induces good sleep. Digestion also gets improved. Winter is the best season to understand the significance and benifits of Abhyanga. Dry, lustreless, dull and cracked skin, painful and cracked feet are some common problems faced during this time. It can all be kept away by regular oil massage.